The Bowflex SelectTech 552 Adjustable Dumbbells have been one of the top selling adjustable dumbbells since they were first released in 2013. These dumbbells can be adjusted from five to 52.5 pounds, offering the ultimate strength training routine for both men and women. 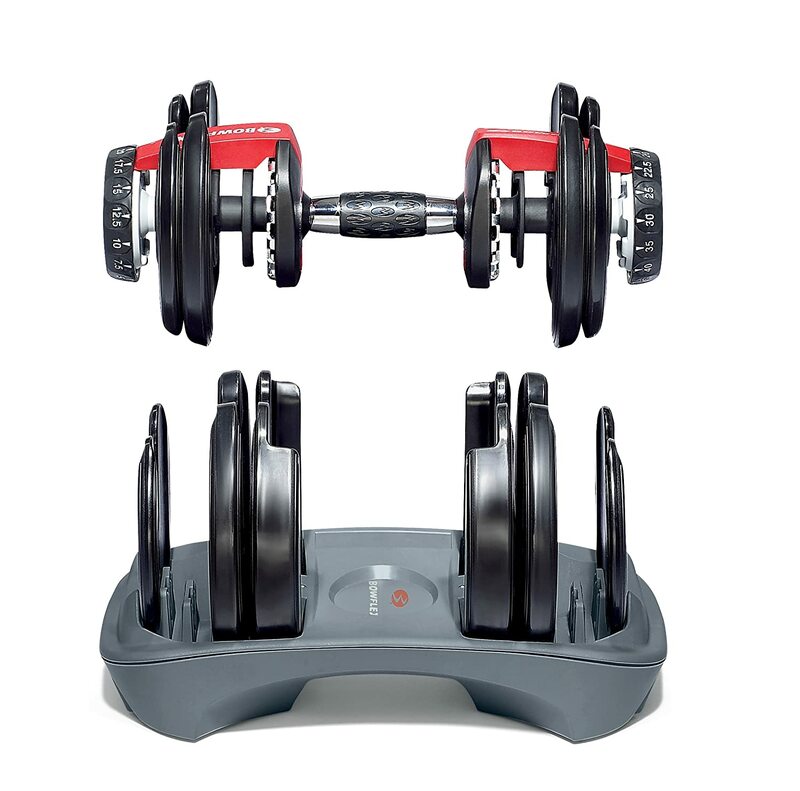 With this unique set from Bowflex, you gain the convenience of having a complete set of dumbbells in one pair. Ideal for anyone seeking to save space, time and energy, these dumbbells offer many features at a mid-range price of just $299.99. The SelectTech 552 Adjustable Dumbbells by Bowflex offer the benefits of owning 15 sets of dumbbells in one convenient pair. With a minimum weight of five pounds and a maximum adjustable weight of 52.5 pounds, both beginners and advanced users alike will find this model appealing. Weight can be adjusted in 2.5 pound increments, allowing for maximum versatility. With a hardy steel construction and textured rubber hand grip, this unique pair of adjustable dumbbells is both comfortable and durable.Customers receive a generous two year warranty from Bowflex which covers the frame and parts. Ideal for anyone seeking to enhance their home gym or save space, the SelectTech 552 Adjustable Dumbbells have a modern design with an ergonomic bar that is comparable to higher end models. Adjusting the weight of the dumbbells takes just a few seconds thanks to Bowflex's signature dial mechanism. With a simple turn of a switch, you can quickly adjust the weight of the dumbbells from five pounds to 52.5 pounds, and anywhere inbetween. While the SelectTech 552 Adjustable Dumbbells offer many enticing features, there are a few downsides that you should be aware of prior to purchasing. Firstly, this particular model can only be adjusted in 2.5 pound increments. While this may not be a problem for everyone, it is worth taking into consideration if precision is one of your top priorities. Another downside is that this model can only be adjusted up to 52.5 pounds. Beginner and intermediate level users will likely find the range of weight challenging and more than enough. These Bowflex dumbbells have remained a bestselling model for several years because they are convenient, easy to use and save space. While this particular model may not be right for advanced users or athletes looking for a more challenging weight range, it is ideal for the vast majority of people seeking a practical strength training solution for their home gym. The dumbbell bar is far from standard with an ergonomic shape and textured rubber grip. This feature ensures comfort while training and can prevent injuries such as wrist pain and losing your grip while lifting. Overall, the SelectTech Adjustable Dumbbells will appeal to virtually anyone trying to start a new strength training routine from the comfort of their home and intermediate to advanced users seeking to push themselves to the next level in their current routine. With an affordable price just shy of $300, this model doesn't just save space, but also saves money since it combines 15 sets of dumbbells in one.